On my way to a Dominican salon, very early one Saturday morning, an interaction between a two year old and her mom caught my attention. 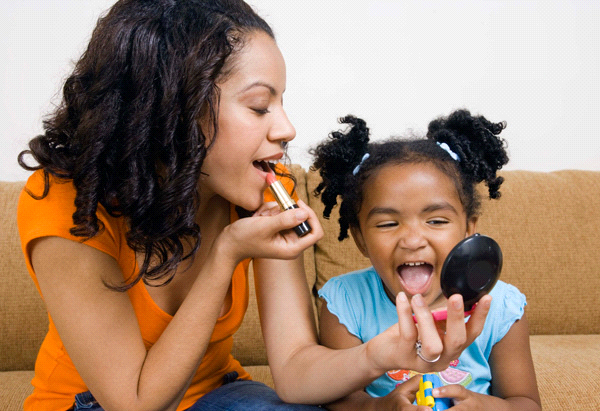 The toddler, fascinated, watched her mom’s every move as she applied her make-up. She used her small hands to imitate her mom’s actions, and giggled every time her mom caught her acting out the steps. It was a very precious moment. At the end of the make-up session the little girl was rewarded with her own tube of clear lip gloss. She squealed in delight as the gloss touched her lips…of course she immediately licked it off- but in her mind she now looked just like mommy. After witnessing this interaction between mother and daughter, it occurred to me that most of us learn beauty secrets from our mother, sisters, cousins and friends. My younger cousin likes to tell the story of how she first learned how to use make-up, amongst many other things, from me as we were growing up. To see how well she turned out I am glad to have been the person she wanted to emulate, and learn from. When I had young daughters of my own, I too played the make-up games with them and they too were also in awe of mom and her products. Now that they are adults they teach me how to really use make-up. They even provide me with make-up tips. It’s a full beauty circle. ← Does Fear Hold you back?